Those who share in the work share in the harvest. This simple, yet essential lesson will be told in a lively, interactive adaptation of "The Little Red Hen" at MCCC's Kelsey Theatre. 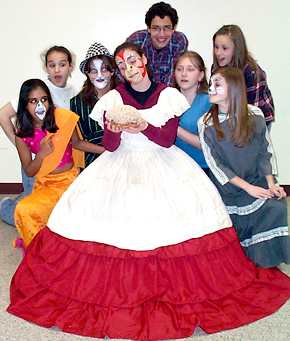 The Kelsey Players presents the popular children's tale Saturdays, May 31 and June 7 at 2 p.m. and 4 p.m. Kelsey Theatre is located on Mercer's West Windsor campus,1200 Old Trenton Road. In an hour-long show filled with catchy songs and gentle lessons about the meanings of responsibility and friendship, the Little Red Hen will beckon her friends to help her with the various steps involved in making bread - from growing to harvesting to baking. This colorful, new version was written by Brian Seward, co-founder and artistic director of the Singapore-based ITheatre, with music by Bang Wenfu. Kelsey Theatre Artistic Director M. Kitty Getlik discovered the innovative ITheatre online. "After reading the script and hearing samples of the music, I thought the show would be quite fun and totally entertaining for American audiences," Getlik said. "The music and dancing, which make up a good part of the show, really infuse it with excitement. We chose to cast actors ages 12 to 16 in order to spotlight the talented young people who participate in Tomato Patch, the college's performing arts workshops for teens that are held in the summer and during the school year." Rosalie Graziano and Madison Glassman. The cast includes Arden Walker as Eglantine R. Hensworth, Rosalie Graziano as Charles Cheeseworthy III, Jessica Getlik as Zebo Kool, Prita Sinha as Esmée Chukkabutti, Jesse Dubin as Egbert Seedly/Ivor Bunn, Amy Slothower as Puppeteer/"Bert"/Chorus; Shannon Spiegel as Puppeteer/"Piccalilli"/Chorus; and Madison Glassman as Puppeteer/"Chickabiddy"/Chorus. The show is directed by Tom Bessellieu, with musical direction by Patricia Bartlett and choreography by Pam Pisani. Tickets are $8 for children, students and senior citizens, and $10 for adults. Free parking is available next to the theater. Tickets may be purchased online or by calling the Kelsey Box Office at 609-570-3333. Kelsey Theatre is wheelchair accessible and provides assisted listening devices upon request. In addition to the weekend performances, Kelsey Theatre will offer daytime performances for local schools and preschools. Call the Box Office for more information on ticket availability and group rates. Funding is made possible in part by The Mercer County Cultural and Heritage Commission via the Mercer County Board of Chosen Freeholders, and the New Jersey State Council of the Arts/Department of State, a partner agency of the National Endowment of the Arts. Tickets are now on sale for the Kelsey Theatre Summer Series. Performances include "The Taming of the Shrew" from June 27-July 6; "Oliver" from July 11-20; "The Fantasticks" from July 25-Aug. 3; and "Winnie the Pooh" from Aug. 15-Aug. 24. Learn more here.